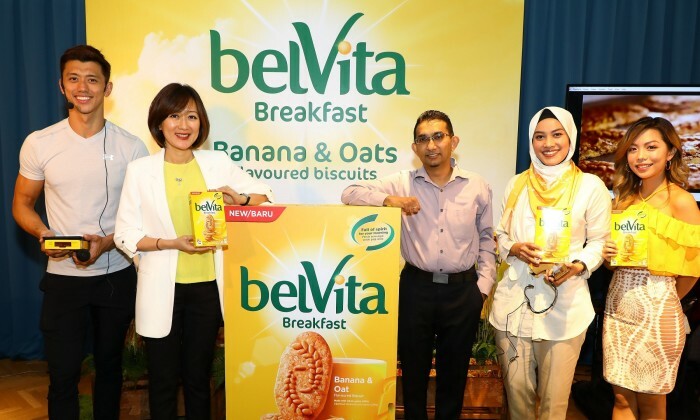 Mondelēz Malaysia (Mondēlez), part of the global snacking powerhouse Mondelēz International, has launched a new product variation for its belVita breakfast biscuits range, belVita Banana and Oats. The new offering is aimed at strengthening its category leadership in biscuits in Malaysia by diversifying its product offerings and catering to a wider group of audiences. The new belVita banana and oats are available at all major hypermarkets, supermarkets and convenience retail stores from August 2017 onwards. With this latest launch, Mondēlez’s breakfast biscuits will be available locally in three flavours; milk and cereal, honey and chocolate and banana and oats. The company, home to iconic brands such as Oreo, Cadbury Dairy Milk, Tiger Biskuat, Jacob’s, Chipsmore, Choclairs and Twisties, employs over 1,100 people across three manufacturing plants in Johor Bahru, Shah Alam and Prai. Mondēlez said it has investment of over RM21 million to add the new production line of belVita to its manufacturing facility in Johor Bahru’s Tampoi. To date, belVita’s production, contributes to 14% of the plant’s current capacity, fuelling the supply of the belVita range across Malaysia and other Southeast Asia markets. Mondēlez launched belVita breakfast biscuits in 2016 in Malaysia on the back of the company’s best performing year since its transition from Krafts Foods, despite challenging market conditions. This included achieving over RM705 million in revenue, recording the highest growth rate in five years and strengthening its category leadership of number one in biscuits (with a market share of over 25%) and second in chocolates, said the company. “As a leader in the biscuits category, we are always focused on innovating and diversifying our product portfolio to meet the changing demands and expectations of consumers. By doing so, we are able continue growing our impact within the market, while extending our commitment in creating moments of joy and empowering consumers to make informed choices for their overall health and wellbeing,” Tan added. First launched in the United Kingdom in 2011, belVita has since been made available in 54 countries around the world, delivering 32,500 tons of whole grains to global diets. The introduction of belVita followed the company’s response to the growing consumer preference towards healthy snacking and convenient breakfast options. As a result, Mondēlez said, belVita has enjoyed high repeat rates in all of the countries that it is available in. Marks & Spencer has opened its first store with a cafe in Hong Kong, with plans to gear its marketing strategy for the cafe toward.. This will manifest the Group’s expansion and market coverage across East Malaysia..
A recent string of ad gaffes by brands such as London Weight Management, Nivea and A&F has left many asking: what in the world wer..